It's time for another Color Throwdown! Barbara is our challenge hostess this week with a combination that includes vibrant shades of blue and some neutrals, too--cobalt blue, aqua, gray, and white. I paired the colors with layout from the current Fab Friday challenge. Since I just got the Happy Hippos stamp set from My Favorite Things, I knew I wanted to use one of the hippos as a gray element on my card. I colored up the hippo and bunch of balloons with my Copic markers, then used my Brother Scan 'n Cut to cut out the colored images. They were arranged on a white pierced circle die cut, using foam tape for dimension. I matted the panel on a gray circle, then adhered it to an aqua cardstock panel over a wide strip of cobalt cardstock. The panel was accented with a strip of gray satin ribbon that I folded and tucked underneath the image. 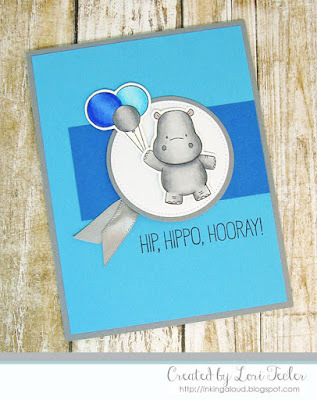 I stamped the set's "hip, hippo, hooray" sentiment beneath the blue strip, then adhered the finished panel to a gray card base. To play along, just create a paper crafted project using these colors as a starting point and add a direct link to your finished project using the linky tool found at the end of this week's CTD post. As always, if you don’t have exact color matches, something close works just fine. Just be sure that the challenge colors are the dominant ones in your project. 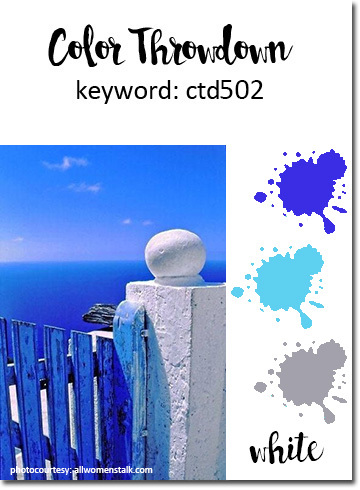 And, if you upload your project to an online gallery, use the keyword CTD502. If you upload your projects on social media, go ahead and use the hashtag #ctd502 and #colorthrowdown. You can find us on Instagram (and on Facebook!) with the username colorthrowdown. Before you get started, here’s some inspiration from the talented Color Throwdown team, our July Guestie Kathy Schweinfurth, and this week's Guest Star Stamper, Lise Mariann. That is too cute! Love your little hippo, perfect sentiment too! Thanks for joining us at Fab Friday, hope to see you again soon! I couldn't read your descriptions...the formatting of the background makes it really hard to read the text but I can definitely see that adorable card! What a sweet hippo in very lovely colors! I couldn't think of a better baby boy card! Thanks for sharing at Fab Friday! Oh Lori, this hippo is ADORABLE! So beautiful and clean - your colors are perfect! Thanks so much for playing at Fab Friday! Love the layout you used on this adorable card!